Luca Pacioli and Leonardo DaVinci--Renaissance men--were both mathematical geniuses. Leonardo was more inclined towards military engineering, while Luca towards abstract and pure math. 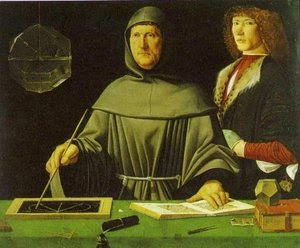 When Pacioli included "Double Entry Bookkeeping" in his textbook, Summa de Aritmetica, which he published in 1494 (two years after Christopher Columbus landed in Santo Domingo), little did he know he would change the world. Both being college professors traveled together and stayed together at different universities. Sigmund Freud—in his study on Leonardo’s homosexuality— ignored this fact. It is a pity because Freud would have brought out factual evidence rather than speculations based on his psychoanalytic techniques. Leonardo, being much younger than Luca, has always been described at Luca's protege. The diagrams and figures one sees in Luca'a Summa were DaVinci's drawings. They worked together as equal partners rather than the master-apprentice relations of the times. Today with time perspective we can understand they had a homosexual relationship; in 1495 they lived together in Venice. History shows that Leonardo was summoned to court to address charges of homosexuality against him. Since the accuser did not show up, the charges were later dropped. While billions of human beings have populated the earth, mostly living in the shadow of survival and mediocrity, the odd, the strange, and the eccentric are the ones who make the most invaluable contributions to the improvement of the human condition. These two eccentrics did make tangible contributions to mankind. While Leonardo's accomplishments have been chronicled and documented--even Bill Gates couldn't resist owning Leonardo's original manuscripts--Luca's contributions are less known. Like our American composer Aaron Copland, I will play a fanfare for the common man: Luca by his ingenious explanation of Double Entry Bookkeeping system made possible international commerce, opening the flood-gates to what today we call "The Global Economy." No longer were businesses confined within frontiers, as banks, financial institutions, entrepreneus, and corporations, bartered, exchanged, and extracted profits across frontiers. The standardization of Financial Statements followed, so that Balance Sheets, Income Statements, and Cash Flows are read and interpreted without major impediments all over the Orb. Yes it was a leap of imagination to design Debits (left side) and credits (right side) as an information system. But this humble discovery made Capitalism the dominant economic system in our day and age. Because of businesses' medical benefits plans for employees --that is, the entire labor force--both genders can now enjoy the latest technologies and thereby live longer, and in good health. "Physical nature exhibits all these dualities," Luca would say. "And so does human nature," would Leonardo retort. "We carry good and evil, love and hatred, in our spirits and bodies--or as the enigmatic Greek philosopher Heraclitus loved to say: 'the way up is the way down, the narrow and the wide.'" "What about Ecclesiastes, Leonardo--didn't he say...?" The observation of these doubles as a system of knowledge permitted Luca to expand it into the Accounting equation where what is on the left must equal what is on the right side (Assets = Liabilities + Owner's Equity). That is, two sides with two different and opposing energies, like protons and electrons whose clash generate light. Although philosophers such as Hegel and Karl Marx attempted to discard the antinomial system by replacing it with a triad: thesis, antithesis, synthesis. They failed; and we can understand why: Hegel professed the State's power, while Marx communism. By now we know the chaotic results of Nazism and Communism. So, the dual system prevails. The natural tendency is duality as proved by the Second Law of thermodynamics: order and chaos (entropy). Though Nature tends to chaos, human natures imposes order; the mind invents patterns of understanding. In this light, the Double entry Bookkeeping system is a triumph of the mind over the chaotic activities of humans engaged in trade. Luca's legacy--accounting system--to the business world is order. It contains: Balance,wholeness, and radiance, because his system dovetails with Democracy, with Freedom to the entrepreneur; a system that coincides with Adam Smith's pillars of capitalism: Laissez-faire (free market economy), competition (Invisible Hand), and the Division of labor (the innate human propensity that creates wealth for all). This is my fanfare to the common man that was the monk Luca Pacioli. Try this little book! It will change the way you write for the best. Comments on "Luca Pacioli and Leonardo DaVinci: Domestic Partners"
i like the article it tells about dual accounting system as well as dualitis in life like dark light,best worst, born die. i like this story because this story let me know more knowledge of Accounting, and know more details of the friendship and relationship between Leonardo DaVinci and Luca Pacioli. Luca Pacioli did very important contribut of Accounting. history,literature and philosophy.it worths reading. Luca Pacioli was looking for his balance while he wrote his Summa de arithmetica; Leonardo de Vinci was looking for his balance while he paint his masterpiece painting "Mona lisa". I have been looking for my balance all my life, maybe the basic accounting form will tell me -what is balance? It is good information about accounting inventer.But I have confution that luca pacioli use "profit equals revenues less expenses (P=R-E)" and u told us that we can not use 'profit'. Hi, my name is vikram yadav.I read this article. I like this article because I didn't know about the father of accounting before, but now I know every thing about accounting.